Classic Chevrolet Sugar Land presents The Exchange Club of Sugar Land’s 32nd Annual Spaghetti Dinner Fundraiser to be held on Friday, April 26th from 5:30 pm to 8 pm in the Fluor Corporation Cafeteria, located at 1 Fluor Daniel Drive, Sugar Land. This fundraiser supports local non-profits including Child Advocates of Fort Bend, Fort Bend County Women’s Center, Texana Center for Autistic Children, Fort Bend Seniors Meals on Wheels, Fort Bend Council on Substance Abuse, Crime Stoppers, YMCA, ESCAPE Family Resource Center, Literacy Council of Fort Bend and many others. It also supports Exchange Cooperative Community Service Projects like Santa’s Exchange, which provides thousands of gifts for underprivileged children. This year there are nine local law enforcement agencies and firefighter teams competing in the Spaghetti Sauce Cook-off. They will be judged by our Celebrity Judging Team, which includes Joe Southern, Fort Bend Star editor; Patti Parish-Kaminski, absolutely! focus media publisher and Minerva Perez, Latina Voices. Each team’s eccentric costumes are always a hit. A children’s area with a cake walk, face painting, games and prizes is also part of the fun-filled event. A live and silent auction, raffle and live entertainment complete this enjoyable evening. Have tickets to Giggle or Celtic Women? 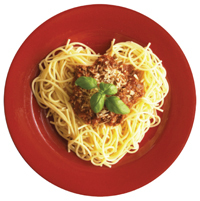 Then join the Exchange Club of Sugar Land at the Spaghetti Dinner for supper! And remember, it’s all for the kids! For more information or to purchase tickets, contact Carlos Perez at 281-923-4900 or look for Eventbrite ticket buttons on Facebook, www.ecsl.org or go to Classic Chevrolet located in Sugar Land.